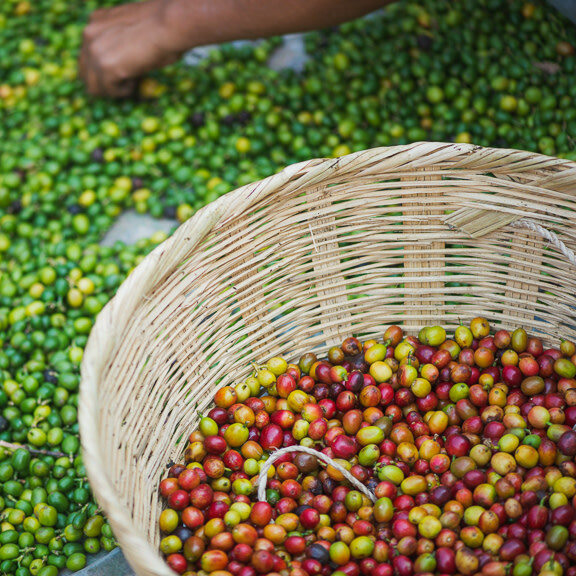 In the world of specialty coffee, most growers sell where they can. As perhaps the best-known producer on the planet, fifth-generation farmer Aida Batlle not only has the power to choose her buyers, but has been known to refuse to sell her coffees to those who don’t properly showcase their exceptional quality. Since we first partnered with Aida years ago, Blue Bottle has considered it a privilege to share her award-winning single origins—each an outlier in every sense of the word—with our guests. With one sip, you’re sure to feel the same way. Finca Kilimanjaro is world-famous, not only for its coffees, but for having a profile typically considered unachievable in El Salvador. In this unrivaled microclimate, Aida nurtures Arabica varieties transplanted from Kenya, one of the most revered origins for quality, into the prize-winning coffees that put her on the map. This edge is thanks to Kilimanjaro’s unique geography. Pushing right up against the frontier of the Cerro Verde National Park, which covers the top of the Llamatepec Volcano, its fertile volcanic soils and remarkable biodiversity create the perfect growing conditions for Aida’s transplants. Of course, these growing conditions would mean little without Aida’s perfectionistic approach to processing. Continuing her homage to East Africa coffees, Aida replicates fermentation styles original to Ethiopia, Kenya, and Burundi before washing and screen-drying cherry on her personal mill. Each bag of El Salvador Aida Batlle Kilimanjaro whole beans is shipped to you within 24 hours of roasting from our Oakland roastery. On the precipice of misfortune, Aida did what great artists do: She sowed new ideas in the fertile earth and waited to see what would grow. Think of Aida’s story when you need a reminder that ingenuity is still there, even when it seems like nothing but a miracle can set you free.